Mostly I just turn all that green and yellow squash into noodles with my sprializer or, even faster, my julienne peeler. But I avoided trying to cook anything more elaborate with it for fear it would turn out soggy. And that was the case with several test batches of this recipe. 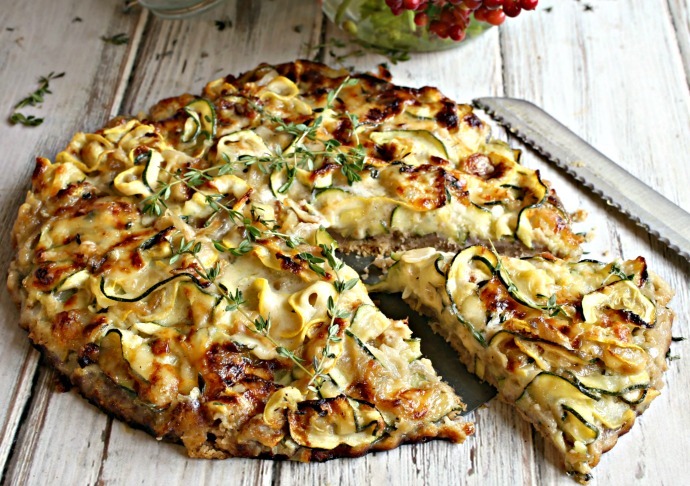 But, after much testing (and much zucchini eating) I found the best version of this tart. Pre-bake the crust a bit, do not pre-cook the zucchini and keep the filling shallow (hence my lack of crust sides) and the result is a perfectly cooked, cheesy tart with a glorious buttery walnut pastry that's not soggy. Bring on all the zucchini. Enjoy! 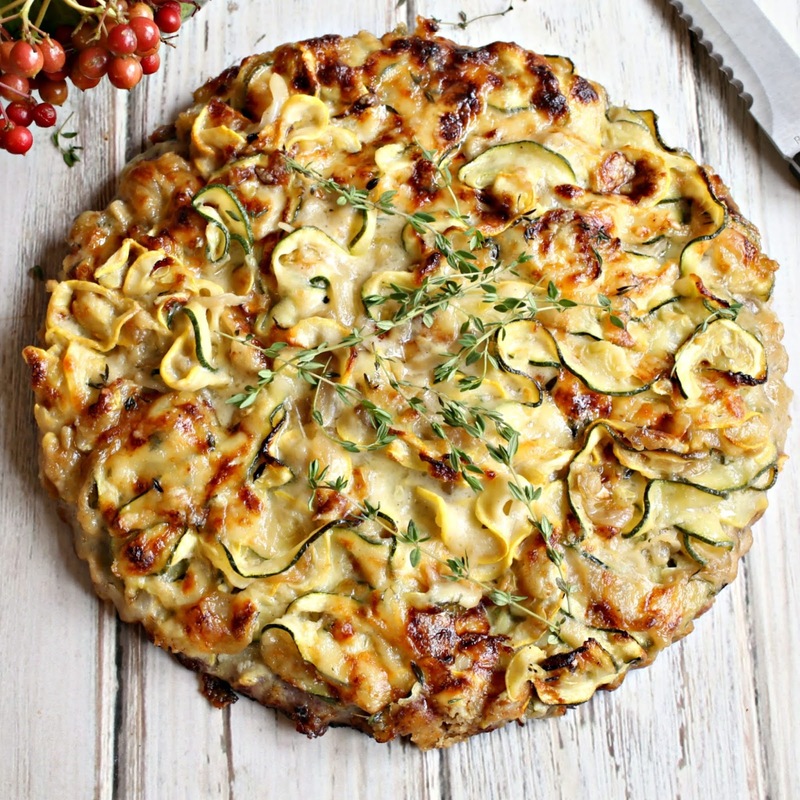 Recipe for a savory zucchini tart with fontina cheese in a buttery walnut crust. To make the crust, add the walnuts to a food processor and pulse a few times until they are in small pieces. Add the flour, salt and butter. Pulse a few more times until the mixture resembles coarse crumbs. With the machine running, pour the ice water through the feed tube and continue until a dough ball forms. Wrap the dough in plastic wrap and refrigerate for at least 1 hour. Prick a few holes in the dough with a fork and bake for 20 minutes. Remove from the oven and allow to cool slightly. While the pie base is cooking, add the butter and onion to a large skillet or cast iron pan. Saute for about 10 - 15 minutes, on medium heat, until the onions soften and begin to caramelize. Stir in the flour and then whisk in the whole milk and heavy cream until there are no clumps left. Stir in the Parmesan or Romano cheese and 1/2 a cup of the grated fontina. Continue stirring until the mixture begins to thicken. Stir in the thyme, mustard, salt and pepper and remove from the heat to cool slightly. When cool, stir in the egg. 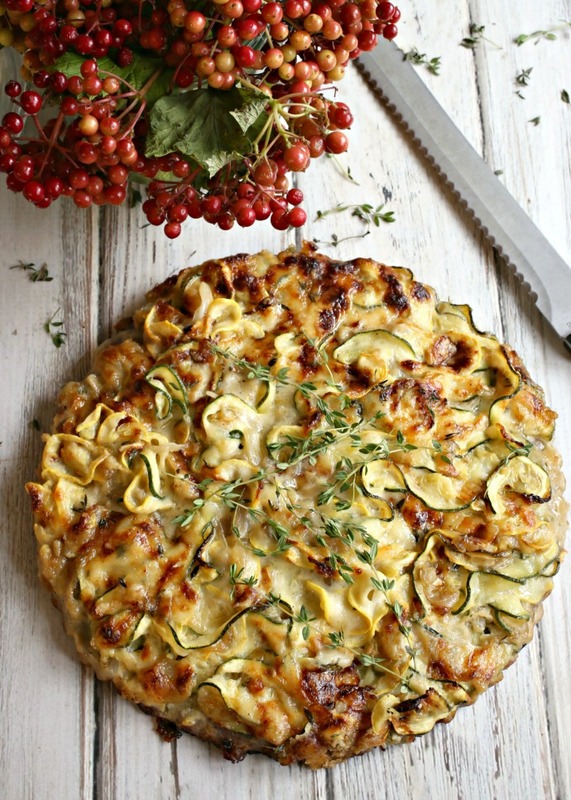 Slice the zucchini and summer squash. You can cut rounds or use the wide setting of a spiralizer, as I did. Stir the vegetables into the filling. Assemble the pie by placing the dough base back inside the tart pan and pouring in the filling. Top with the remaining fontina cheese and bake for 20 to 30 minutes or until the cheese is a golden brown and the filling has set.